I brought this to use in the kids snow cone machine. The watermelon flavor was good not too sweet we all loved the taste and it was easy for the kids to use. This gallon of Watermelon flavored ready to use shaved ice/snow cone syrup is made with the finest ingredients in order to provide you the truest, most mouth-watering flavors. No mixing and no mess, this syrup comes ready to use. Just open the bottle to dispense delicious syrup. Excellent flavor, I would highly recommend this product to everyone, especially if you love watermelon. Great substitute in the winter when you can't buy watermelon. 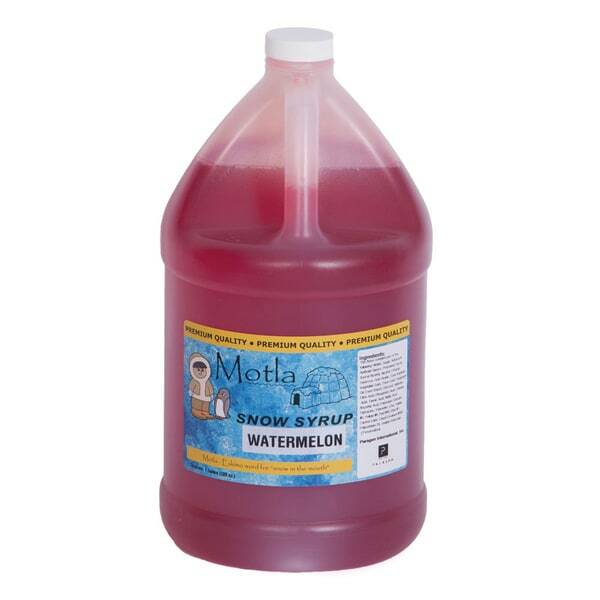 Motla Snow Cone Syrup has the truest flavor of all snow cone syrups we've tried. Give it a try, it won't disappoint! all the kids at the party loved this flavor?